Established in 1995, Summit Technology (Hong Kong) Limited is one of the fast growing and innovative Building Information Modeling (BIM) solution providers in Hong Kong. We serve clients from different sectors of the industry who engage in building, civil engineering, electrical and mechanical engineering, property development, etc. Over the past 10 years, we have been working closely with Autodesk in providing Autodesk solutions, products training, project implementation and consultancy services. 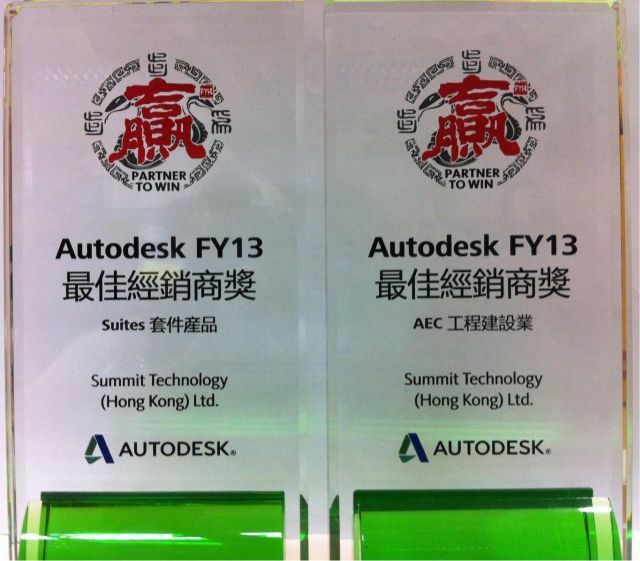 Since 2007, we have become Autodesk Gold Partner in Building Architecture, Building Engineering and Building Structure and in the same year, we set up the first Revit ATC (Autodesk Authorized Training Centre) in Hong Kong. Be a strategic partner to our clients by providing a total solution in maximizing investment in long run. Acting as a key bridging role in sharing and introducing Autodesk technology to the industry while we strongly believe that cutting edge software solution together with excellent industrial expertise are the driving force of industry progression. Being Autodesk Gold Partner, we provide solutions by using a series of Autodesk software including AutoCAD, Revit Architecture, Revit MEP, Revit Structure, 3ds Max, Naviswork, Buzzsaw. Autodesk BIM enables the creation and use of coordinated, consistent, computable information about a building project in design. Being the Autodesk Authorized Training Centre, we are in compliance with Autodesk's rigorous standards of excellence and deliver hands-on, instructor-led training to design professionals using Autodesk software. We provide professional Revit training, BIM project based training and BIM project leaded training service. Enhance your knowledge in mastering the hottest BIM technology, get trained from us. Since 2009, we have been appointed as a local Autodesk Certification Center. We offer Autodesk Certified Associate and Certified Professional Examinations, which help you to gain an industry recognized credential. ATC & ACC Venue: Room 1903, Aitken Vanson Centre, 61 Hoi Yuen Road, Kwun Tong. We incorporate expertise and insights from both technical professionals and industrial specialists to fulfill clients’ business needs and cope with changes. Being a reliable solution consultant, we embrace and drive technology-enabled solutions to enhance our clients' overall performance and help sustain their business among the industry. We help them to adopt and make better use of leading-edge information technology and best practices to gain competitive advantage in local and global markets. We have been named the best Autodesk Reseller in Architecture, Engineering & Construction (AEC) industry and 3D Design & Creation Suites, which has brought us industry recognition.